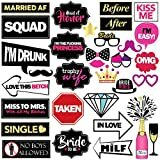 34 PIECE PACK: Pack includes a variety of hilarious signs for you and the girls at your bachelorette party! Includs glasses, hats, bow ties, lips, cakes, and funny signs! BEST QUALITY: All of the gold outlines on the paper photo props are accented with glitter to make you and the girls sparkle for the festivities. Our bachelorette props are made from usable paper! GUARANTEE: We stand by our photo props with a 100% money back guarantee. 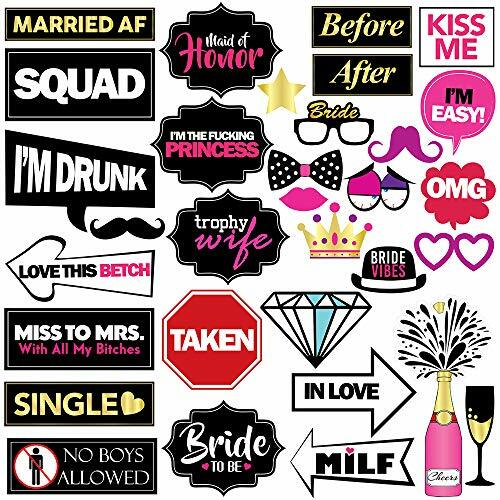 If these bachelorette party decorations do not make you and your loved one's smile, then your money back. EASY TO ASSEMBLE: Attach the paper products via tape (included in pack) to the bamboo dowels (also included with pack).